Sheepshead is a popular American card game that originated in Central Europe during the eighteenth century. In the middle of the nineteenth century, the first major wave of European immigrants arrived in the United States. While the city of Milwaukee attracted immigrants of all kinds, Germans quickly became the largest immigrant population in the city; by 1880, German immigrants comprised 27 per cent of the city’s population. German immigrants not only brought whatever possessions they could carry with them but also their favorite pastimes and hobbies. Sheepshead, the American version of the German card game Schafkopf, was one of many cultural effects that German immigrants brought to Wisconsin. Similar to Pinochle and Euchre, Sheepshead requires thirty-two cards, 7s up through aces, with a designated trump suit. Cards are worth between 0 (7 through 9) and 11 (aces) points; each player receives six to start. The “picker” can exchange two cards from his or her hand from the “blind.” Points are earned by taking “tricks”; non-pickers must reach 60 points to win the hand, while the pickers must reach 61. 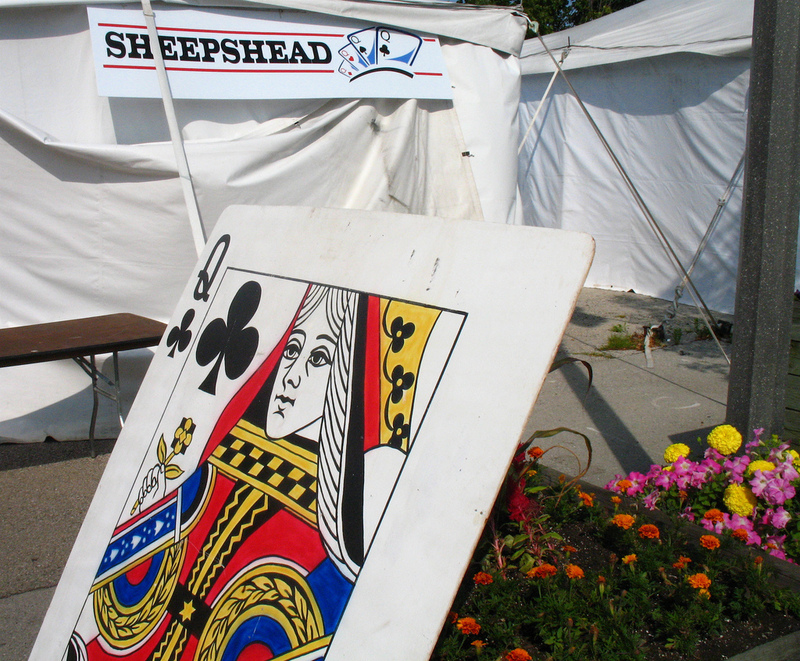 Sheepshead became part of Milwaukee’s heritage as German-Americans played the card game competitively in their homes, neighborhoods, and associational gatherings. Milwaukee’s Deutscher Club attracted prominent German-Americans for its dedication to German traditions, but many members joined the organization to socialize with fellow beer-drinkers and card players. More middling German-American immigrants gathered at taverns and biergartens to enjoy a stein, converse, and play card games. More experienced players today can join Sheepshead leagues. Germanfest, Milwaukee’s annual celebration of its German heritage, offers classes for beginners and tournaments for seasoned Sheepshead players. ^ “Schafskopf!,” German Fest accessed September 8, 2015. ^ Jennifer Watson Schumacher, ed. German Milwaukee (Charleston, SC: Arcadia Publishing, 2009), 7-8. ^ “The Germans,” (under 1800s), Milwaukee History, History Comes to Life, Milwaukee County Historical Society, accessed September 8, 2015. ^ “Schafskopf!” German Fest, accessed September 8, 2015. ^ Bill Zaferos, “Is a Renaissance in the Cards for Sheepshead?” On Milwaukee, March 2009, accessed September 8, 2015. ^ “History of the Wisconsin Club,” Wisconsin Club website, accessed September 8, 2015. ^ Martin Hintz, A Spirited History of Milwaukee: Brews & Booze (Charleston, SC: The History Press, 2011), 83. ^ “Schafskopf!,” German Fest, accessed September 8, 2015. Nimtz, Judith. “Breaking through the Assimilation Barriers: The German Immigrants in Milwaukee, 1840-1860.” MS thesis, University of Wisconsin-Milwaukee, 1988. Rosch, Erica. A Field Guide to Sheepshead. Oregon, WI: Badger Books, Inc., 2001.